For research and forecasting purposes, INPUT defined the structure of the industries it studied. Delivery modes of service are specific products and services that satisfy a given user need. Market sectors specify who the buyer is and Delivery Modes specify what the user is buying. As buyers grew and their needs evolved and as new services emerged and new delivery modes of service evolved, industry definitions expanded. Listed below is an example of the industry as it was structured in 1991. For purposes of general understanding, we present an example of industry structure as defined in 1991. INPUT used this structure to develop market forecasts and analyses for that year. Please note that most INPUT studies include the specific market structures and definitions used to develop each work product (e.g. in a 1982 report you will find definitions applicable at that time, in a 1997 report you will find definitions used at that time, etc.). 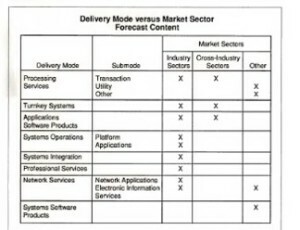 Market sectors were studied and forecasts were presented by delivery mode within market sectors. In 1991, INPUT analyzed 15 industry market sectors and 7 cross-industry market sectors. Examples of ‘industry market sectors’ are insurance, transportation, etc. Examples of ‘cross-industry market sectors’ are accounting, human resources, etc. For a more complete discussion of INPUT information services industry structure and market sector definitions, please refer to Definition of Terms Used.